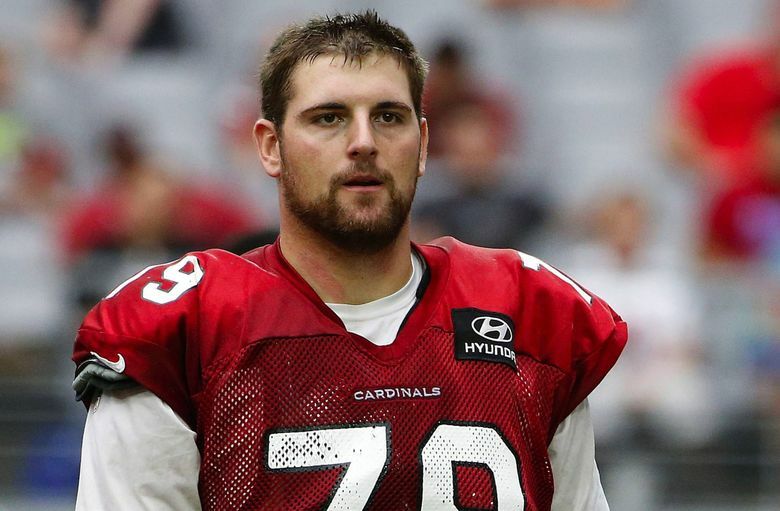 The Seahawks on Monday signed offensive lineman Bradley Sowell, who spent the past four seasons with the Arizona Cardinals. This probably isn’t the big-splash offensive line signing Seahawks’ fans have been hoping for. But the team did sign a free agent addition to the offensive line on Monday coming to agreement on a one-year deal with Bradley Sowell, formerly of the Arizona Cardinals. The deal is reported to be worth $1.5 million. Sowell, 26, started 12 games at left tackle for Arizona in 2013 — when his minus-38.4 rating from Pro Football Focus was the lowest for eligible tackles — but has played sparingly since then, on the field for just 33 snaps in 2015 and zero in 2014 after the Cardinals signed free agent Jared Veldheer to play left tackle. Sowell, who was an unrestricted free agent, appears to be being added as a depth player at tackle and guard (and apparently can long snap some, as well). Sowell, who visited the Seahawks last week, is the first outside free agent Seattle has signed since the free agent signing period began last Wednesday. His salary is low enough that it should not factor into the compensatory draft pick formula, which is considered a priority for Seattle at the moment —the Seahawks so far appear on track to get three in 2017. Sowell, who played at Ole Miss, entered the league in 2012 as an undrafted free agent, originally with Tampa Bay and then with the Colts before landing in Arizona. He made the three-year league minimum of $660,000 in 2015. Sowell’s signing comes as the Seahawks still wait to hear what will happen with free agent left tackle Russell Okung, who reportedly had a meeting with Steelers’ offensive line coach Mike Munchak on Monday after visiting the team on Sunday. Okung has offers from the Steelers, Lions and Giants and is also still considering the Seahawks. Seattle also has lost guard J.R. Sweezy to Tampa Bay backup guard/tackle Alvin Bailey with the Seahawks undoubtedly hoping he can add depth at those spots, as well. The Seahawks are also still in the running for another former Arizona offensive lineman, Ted Larsen, who visited last week and is thought choosing between Seattle and the 49ers. Larsen started 10 games at guard for Arizona in 2015. Sowell becomes the 10th offensive lineman on Seattle’s current roster joining centers Patrick Lewis (who was tendered an offer as a restricted free aent but has yet to sign it), Will Pericak, Kristjan Sokoli and Drew Nowak, guards Justin Britt and Mark Glowinski and tackles Garry Gilliam, Terry Poole and Kona Schwenke.